Dig up crowded bearded german iris rhizomes now through August. Shake soil free and cut off old rhizome, leaving only fresh new growth. They should look very healthy; no shriveled or holey parts! Trim off flower stem and leave about 6-8 inches of leaves on the new rhizome. Keep them dry till you are ready to replant. There’s no hurry, they can get pretty dry and still live. Once mine set a week in a brown paper bag and survived, though I’m not recommending you do that. If it had rained on them they would have rotted so keep them dry. 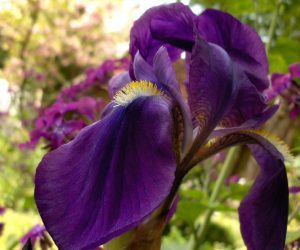 Iris’ are most particular about position of rhizome in the soil. Build a mound with holes on each side. Place rhizome on mound and roots in holes. This keeps rhizome on top of soil and sun can get to it. If planted under soil or if top of rhizome is mulched, there will be a lot more problems with those nasty big bugs that burrow through the rhizome leaving large holes. Actually the moth lays its eggs now and they eat up the rhizome next spring when they hatch! Saw tooth edges on new growth indicates borers are present. Either consider ignoring the disfigurement of the leaf and flower, spray with systemic, or dig up, divide and toss out infected part. Although several borers have infected my plants, they come and go and I still get beautiful flowers-without spraying. Some gardeners have stopped growing these lovely flowers because of infestations—not me. It would not be spring in my garden, without the scent and beauty of bearded iris. Don’t forget to water down those replanted rhizomes. They should develop new sets of healthy leaves before frost, and you may get blooms next year! Iris survive well without much attention. Not much water, fertilizer, or mulch, just divide every 4-5 years when they get over-crowded.